I have always had a negative imagine of bikers and the motorcycle culture. Growing up the son of a doctor, I was alway told to stay away from motorcycles. My father shared stories from the emergency room about how dangerous cycles can be. Never having first hand connections to bikers, I assumed the movie depictions of bikers as hooligans and degenerates were accurate. Last week Griffin’s scout troop was asked to help out with a veterans ride sponsored by Wolverine Harley-Davidson in Clinton Township Michigan. At first I was uneasy. Not many scouts were signing up to help out. Griffin, being eager to check out something new, insisted that we attend. I couldn’t say no to my son. With reservations we signed up to attend. 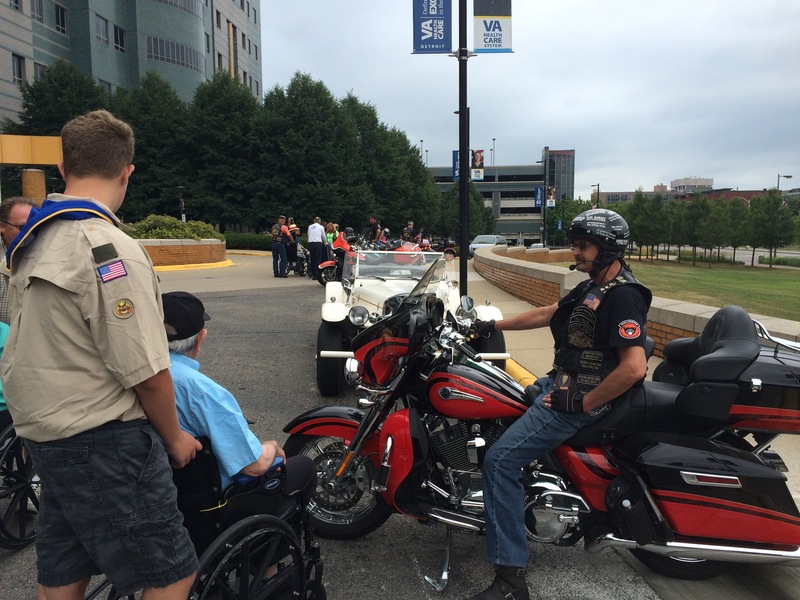 Visiting veterans at the VA Medical Center in Detroit is a good thing to do, even if the event is being put on by a bunch of bikers. We arrived at the Harley dealership early. Griffin was a bit nervous seeing rough bikers all decked out in leather. Smoke pluming from their mouths as they exhaled. I hid my prejudice and walked up to meet the organizers. We were greeted with wide smiles and open arms. A couple of female bikers were eager to get pictures with Griffin all decked out in uniform. They asked how were heard about the event and were excited to have us join the ride, even from our car. I was astonished by the organization and rules the cycle club had in place for the ride. We followed the Harley line of 84 bikes the 20 miles downtown to the VA Hospital. Nurses meet our group at the door. The event organizers restated the purpose of the ride: “To put a smile on our VETS’ faces and get them outside for some air”. He announced that the ride raised $10,000 for the veterans recreation services department, “because they need to get outside now and again!” Then each participant went to a hospital ward to deliver a bag of toilettes to every veteran in the hospital. “If they can get in a wheelchair, bring them out to check out our bikes!” Were the last words shouted out before we entered the hospital. 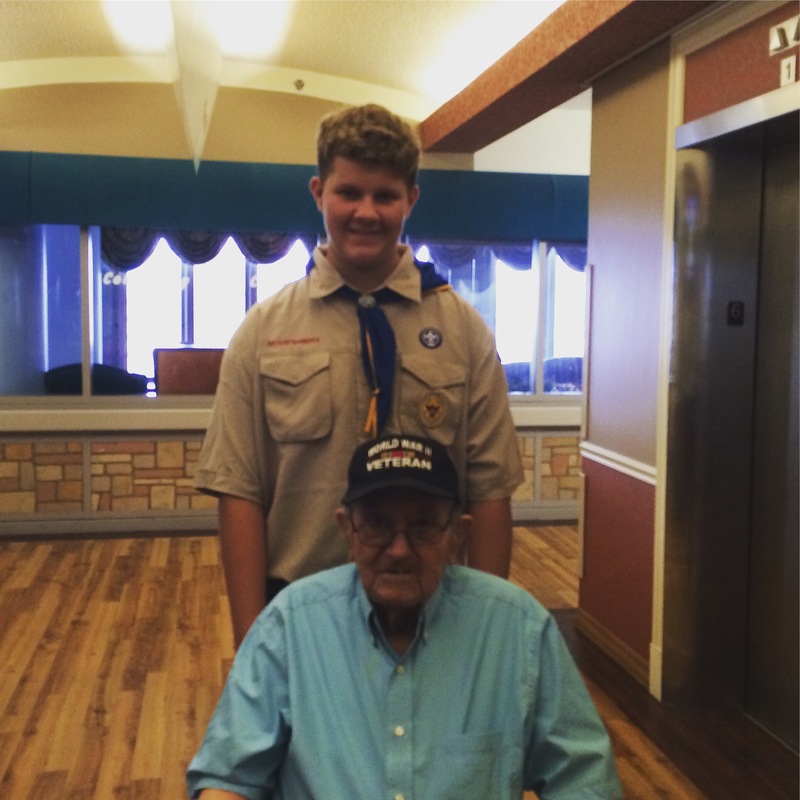 Griffin meet Mr. Z and World War 2 veteran. He was excited to just see a young man’s face. We took Mr. Z outside. He marveled at the wondrous machines parked at the front of the hospital. Griffin listen as Mr. Z shared advice and stories of his experience. All the bikers were interacting with Mr Z ad thanking him for his service. Mr. Z was sad when we had to leave 2 hours latter. He just enjoyed talking to those that would listen. My perceptions were changed this day. No longer will I prejudge a group based on stereotypes. Thanks to Griffin’s desire to go, I learned that this group of bikers are passionate about helping and serving others. I am sure many road clubs do similar things. My lack of experience led me down a road of prejudice. As learners we need to take on new experience with open minds. We can’t let our fears of the unknown hinder our lives. As summer’s end creeps upon us, I will need to remember to overcome my prejudices during the up coming school year. Judging students by their daily actions and not lumping them into a stereotype.